Pavel Harbe asked an interesting question with respect to the original version of the Progressive Enterprise Architecture Map: “Why … is Strategy first and then Motivation and not in opposite order (or in many iterations)?” and goes on to explain that, yes, in fact Motivation should precede Strategy (at least initially, and then followed by possibly several iterations). Of course, Pavel is correct …but so is the diagram (see below). 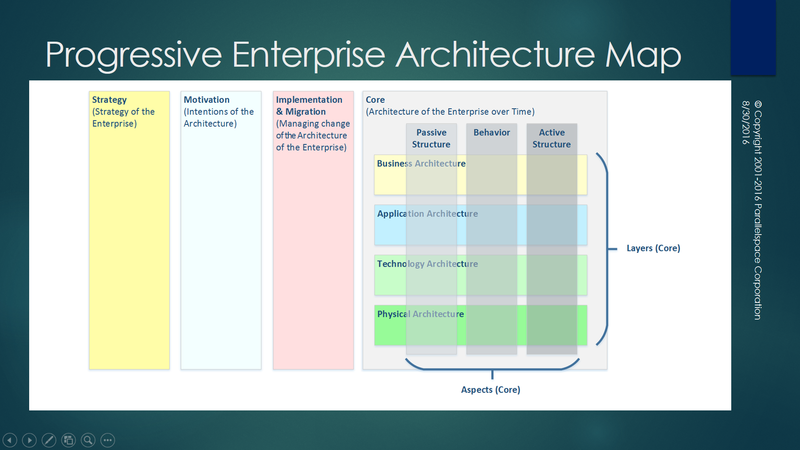 However, Pavel’s comments do indicate a need to clarify these points – here in text as well as in a new version of the Progressive Enterprise Architecture Map. Strategy refers to the “Strategy of the *Enterprise*”, the organizational strategy. 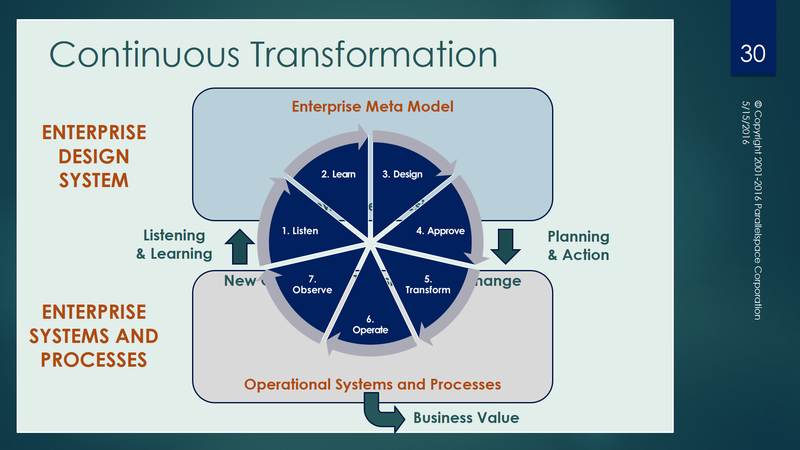 The original diagram referred to the strategy of the organization driving the motivations [intentions] for the companion enterprise architecture. Given pragmatic usefulness is one of my goals for the Progressive Enterprise Architecture Map (while at the same time preserving architectural simplicity), the following elaboration is warranted: adding 2 more layers to clarify the levels at which Strategy and Motivation are used to drive continuous transformation of the organization and its enterprise architecture. 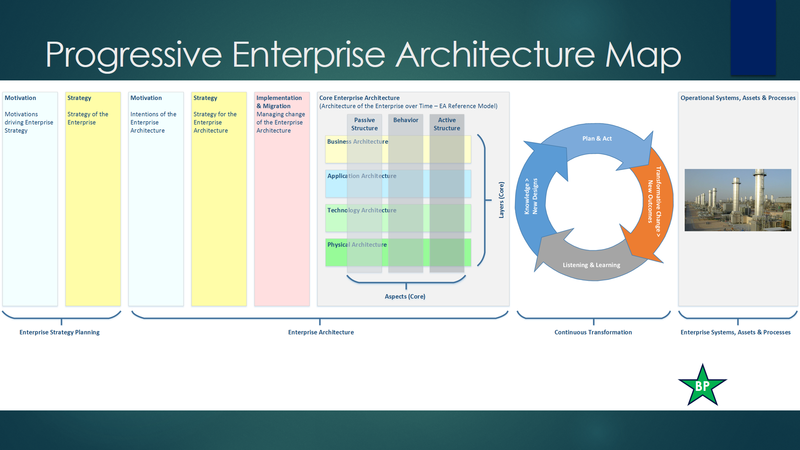 Here is version 2 of Progressive Enterprise Architecture Map. On the left side of the diagram, there is a distinct pair of Motivation and Strategy layers for enterprise-level strategy planning. 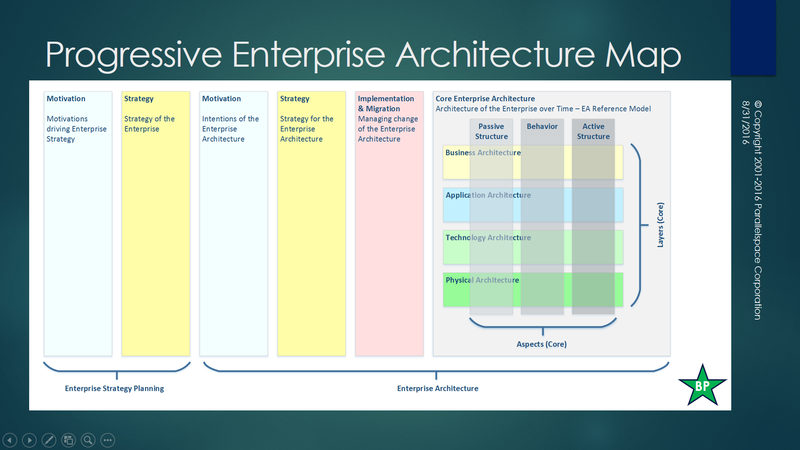 In addition, there is a distinct pair of these 2 layers which transform the enterprise-level drivers, goals, and strategies into drivers, goals, and strategies for the enterprise architecture. You can argue these should be the same but due to many reasons such as timing and resources, they are not always the same. Here’s version 3 of the Progressive Enterprise Architecture Map (linked to Continuous Transformation and Total Enterprise Architecture Management).